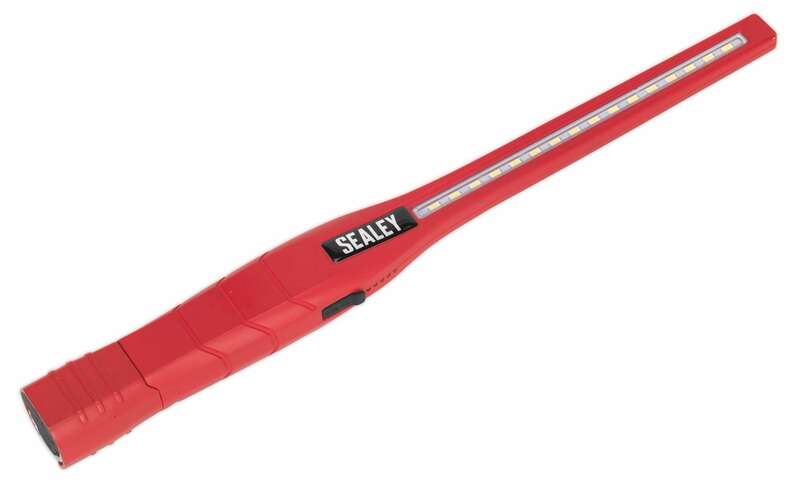 • Exclusive patented design owned by and registered to Sealey. • Each lamp houses 16 super bright SMD LEDs providing up to 600 lumens through the adjustable rotary switch and a 1W SMD LED directional torch. • Slimline design with minimum thickness of 9mm. • Features a single hanging hook, magnetic base allowing hands free operation and battery level indicator. • High quality 2.6Ah 3.7V lithium-ion battery for longer life, no memory effect and a much slower discharge than traditional Ni-MH batteries. • Supplied with a high quality braided USB lead.